Buying a real estate asset to offer for rent has, for ages, been a surefire way of making your wealth grow. While, the rental income earned from a property helps the owner pay the never ending bills, the capital value appreciation over time ensures that the penny you spent yesterday is worth more tomorrow. Dubai, thanks to its rapid rise over the past few decades, has become one of the most rewarding real estate markets in the world. With average apartment rents remaining persistently close to 8% over the years, the city has frequently drawn investors away from established mega cities, which, although offer good returns, lag far behind when compared to Dubai. Considering that investors like to invest in properties that earn hefty rents, we have compiled a list of localities in Dubai where studio apartment rents remained the highest in April 2016. And without further ado, let’s delve into details. For starters, the area is, well, clearly visible from space besides being the absolute iconic landmark of Dubai. Accommodations on its fronds are indeed one of a kind in the world, not only offering the ultimate pleasure of luxury living, but gorgeous views of the Persian Gulf also. This is the reason properties on the Palm attract well-heeled clients in abundance all year round. Studio apartments here earn a rental income of AED 86,000 per annum on average, although individual unit rents go much higher. Average rental yield for studio apartments on the Palm remained 6% in April 2016. 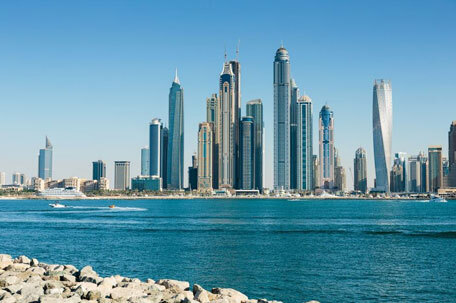 The area is certainly among the poshest localities for living in the emirate thanks to the endless stretches of beautiful beaches and numerous lifestyle and entertainment avenues. Studio units in JBR also return annual rent of AED 86,000 on average, according to data compiled in April 2016. Rental yield was recorded at a sturdy 7% on average. Dubai Investment and Finance Centre is right in the center of Dubai’s business heart, making units here extremely popular with senior executives and business leaders. Close to the major Sheikh Zayed Road and Emirates Towers, the area is easily accessible by Dubai Metro, making its value even greater. Studio units in DIFC fetched rent of AED 85,000 on average in April 2016, giving out a return on investment of over 7%. The Burj Khalifa, flashy cars, fancy restaurants, avant-garde boutiques and rubbing shoulders with Dubai’s who’s who. This certainly sums up Downtown Dubai. The locality is as popular as they get, with studio units earning landlords rent of AED 79,000 on average in April. The units provided average rental yield of 6%, making them a viable investment option. Bordering the lush green Emirates Golf Club, studio units in The Views were being rented for AED 77,000 on average in the outgoing month, earning owners a return of 8%. The locality is easily accessible from major roads spanning the length of the emirate, as well as through Dubai Metro. If there’s one locality people in Dubai want to live in more than any other, it is certainly Dubai Marina. Yacht-lined piers, waterfront views and a multicultural living experience are few of the things that make the area stand out. Then there are the host of lifestyle amenities such as shopping malls, gyms, restaurants and entertainment outlets that keep the residents engaged. Studio apartments here are of high quality and fetched rents of AED 75,000 on average, making the average yield come to 6%. So if you are looking for attractive investment opportunities, be sure to check options in these areas here. Happy apartment hunting!